Parklands Country Gardens & Lodges further cemented the Blue Mountains’ reputation as the nation’s premier holiday location. The new Parklands Country Gardens & Lodges luxury accommodation property at Blackheath has further cemented the Blue Mountains’ reputation as the nation’s premier holiday location. Situated within a spectacular 28 acre heritage property adjoining the Greater Blue Mountains World Heritage Area, Parklands opened its sweeping gates to leisure, conference and wedding guests on September 15. 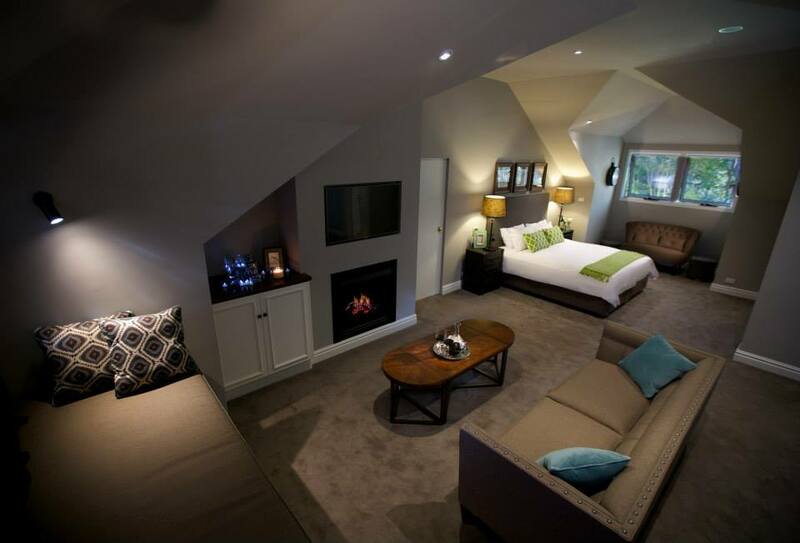 The secluded retreat is part of the Escarpment Group, which also owns Lilianfels Blue Mountains Resort & Spa including Darley’s Restaurant, Echoes Boutique Hotel & Restaurant at Katoomba and the iconic Hydro Majestic Hotel at Medlow Bath. Blue Mountains Lithgow & Oberon Tourism chairman Daniel Myles welcomed Parklands: “The Blue Mountains has been synonymous with romance, quality and luxury getaways for more than a hundred years. Parklands Country Gardens & Lodges sits among beautifully manicured grounds overlooking lush green gardens lined with old pines, cypresses and Japanese maples planted more than 100 years ago. Reminiscent of a grand European estate, it is set in an inspirational location near the magnificent Govett’s Leap Lookout and minutes from the quaint mountains village of Blackheath. 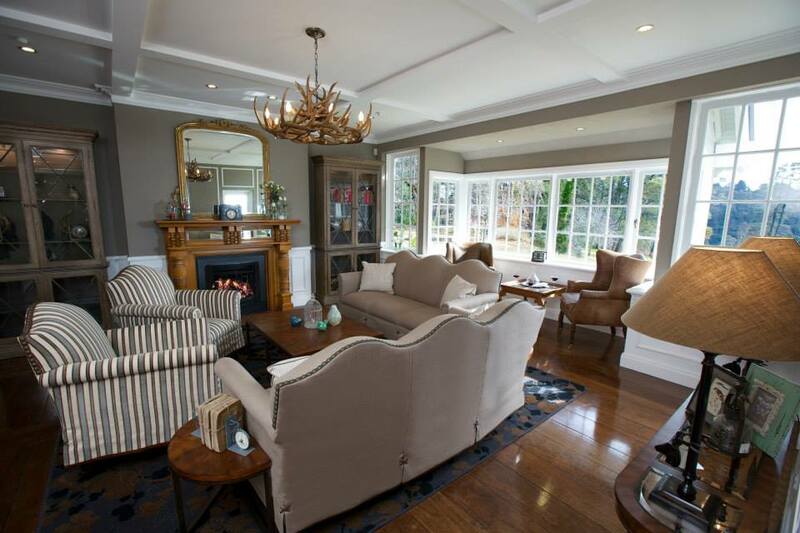 The elegant New Hamptons feel of light-filled rooms, Elk-horn chandeliers and striped wing-backed lounges comes after an extensive refurbishment project that has seen the seven garden cottages and main guest house transformed. 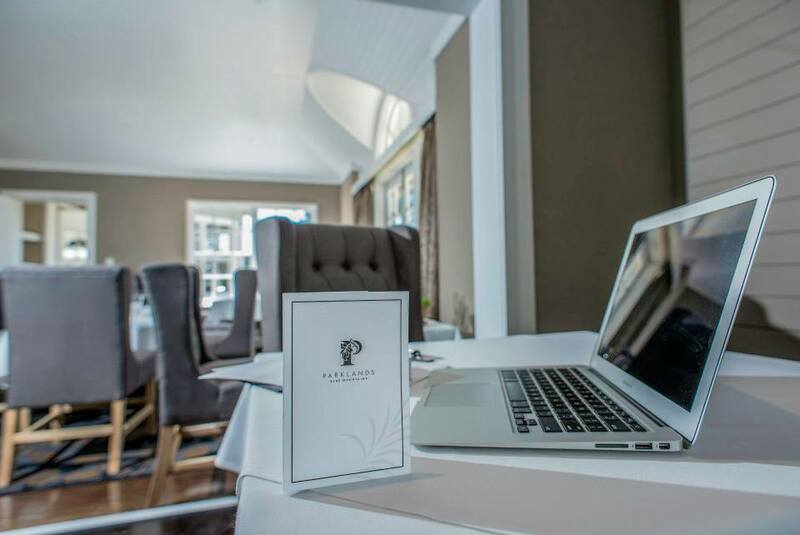 Also ideal for conferences, Parklands is perfect for weddings and boasts the Karawerra function room seating up to 60, Lakeview Restaurant and numerous ceremony and photography locations indoors and out including a private lake with jetty. The day spa overlooking the gardens caters for individuals and couples and is stocked with the Parklands Kerstin Florian range of treatment products and chef’s kitchen gardens. Parklands will continue to evolve, with phase two to include unique team building experiences such as Segways, laser tag, bushwalking, cooking and demonstration classes, while music and regional food and wine tasting can be arranged to suit. Take advantage of the Parklands Country Gardens & Lodges opening special: guests who stay two nights or more will save 20 per cent and receive a bonus gift. The Parklands Spring Escape Deal includes free WiFi access, daily newspaper, self-car parking and use of all resort leisure facilities plus Kerstin Florian travel size samples of Turkish Body Scrub with Eucalyptus and Lavender Body Spray on arrival (retail value $30). Contact Parklands Country Gardens & Lodges, Govetts Leap Rd, Blackheath, on (02) 4787 7211 or at reservations@parklands.com.au to make a booking. Go to www.parklands.com.au for more information. Foodies can indulge in a mouth-watering array of gastronomical events at a dozen of the top nosheries in the Blue Mountains during the annual Good Food Month throughout October. 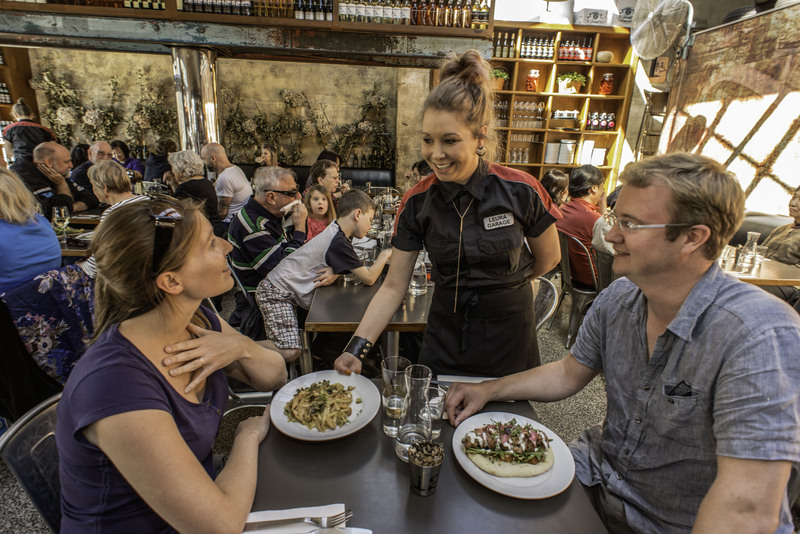 The events at cafes and restaurants will be held under the umbrella of the Greater Blue Mountains Food & Wine Development Advisory Group, a committee of Blue Mountains Lithgow & Oberon Tourism (BMLOT), as part of Australia’s largest food festival. 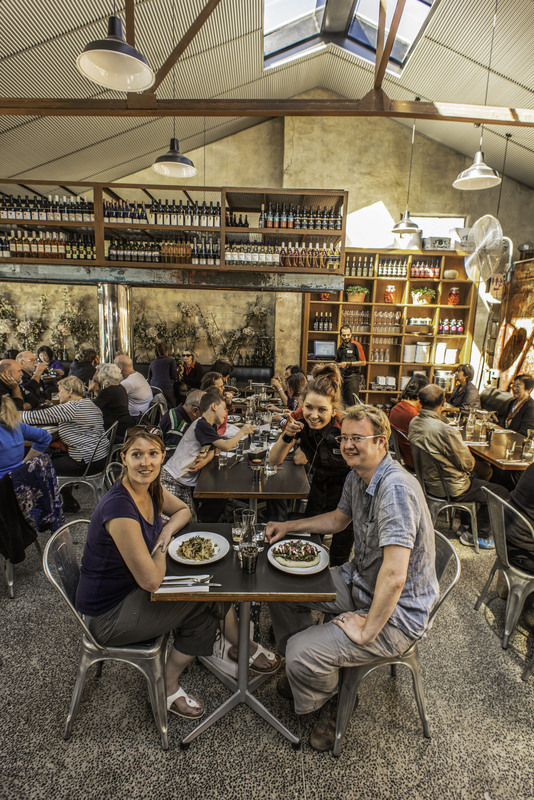 Advisory group chairwoman Pam Seaborn said: “The quality of the food in the Blue Mountains has improved significantly during the past couple of years with some cafes and restaurants even becoming tourist attractions in their own right. “We’re not shy to admit that our cafes and restaurants have attracted some top chefs who have national and international experience. 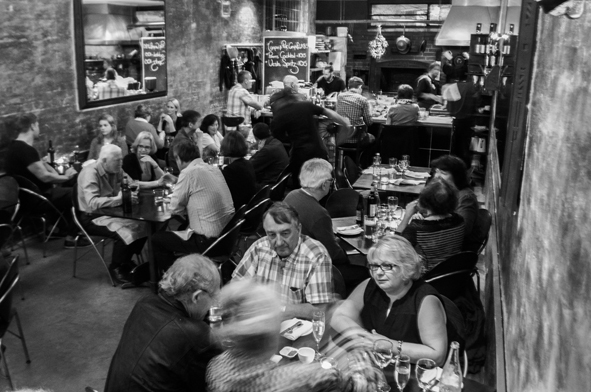 They bring with them a loyal following of diners eager to see how a change of scene has influenced their menus. 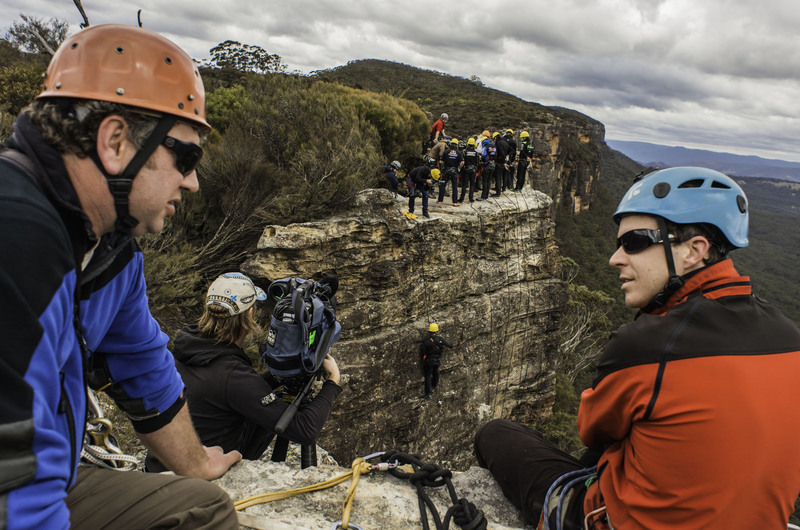 BMLOT chairman Daniel Myles said: “It is a well-established fact that the Blue Mountains is one of the most magnificent destinations on the planet. It is crucial that our food scene matches the vistas and experiences. I am proud to report that it does – a dozen times over. 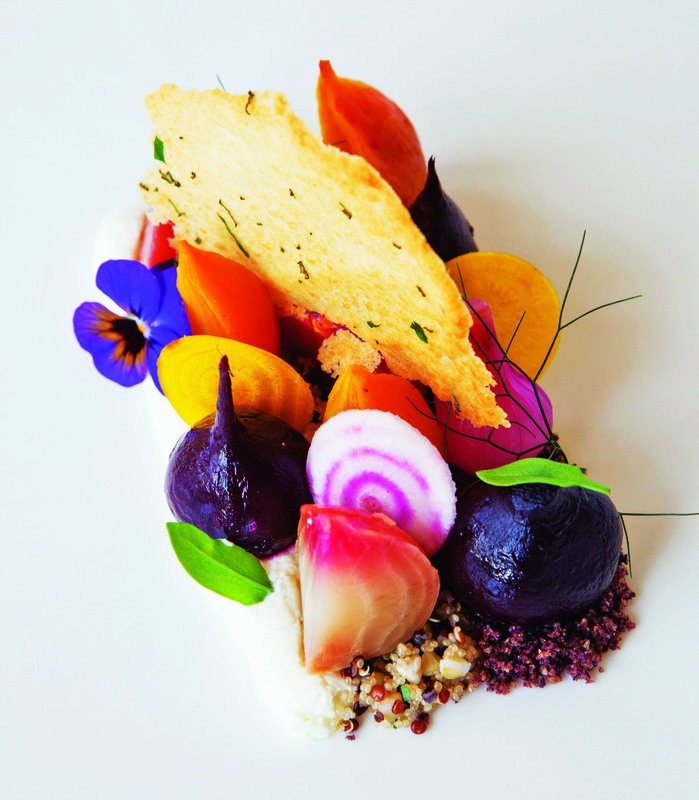 Darley’s will serve a regional table six-course degustation during Good Food Month. 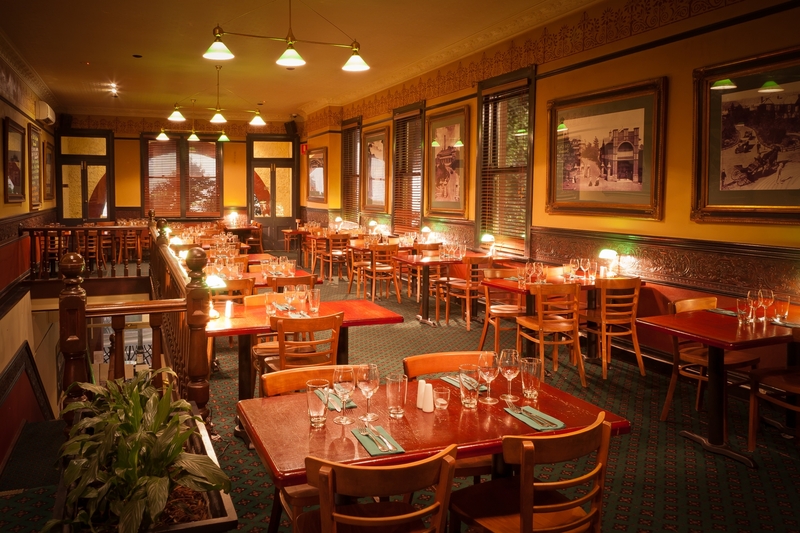 Darley’s Restaurant, Lilianfels, Katoomba: Regional table six-course degustation by chef Lee Kwiez will highlight the diversity of produce and suppliers and micro-climates in the Blue Mountains and surrounds. Cost: $165 per person. Bookings: reservations@lilianfels.com.au. Details: lilianfels.com.au. Fairmont Resort Blue Mountain, Leura: A dinner that highlights produce from suppliers located within an 80km radius of the hotel on October 31. Cost: $85 per person. Bookings: (02) 4785 0000 or reservations@fairmontresort.com.au. Jamison Views Restaurant, Mountain Heritage Hotel & Spa Retreat, Katoomba: Tuck in to a fixed three-course dinner with matching local wines, including favourites such as confit of Pepe’s duck, Horsley pork forequarter and a Molong egg custard while enjoying the spectacular views on October 4, 11, 18 and 25. Cost: $89 ($69 without wine). Bookings: (02) 4782 2155 or contactus@mountainheritage.com.au. Cafe Madeleine, Leura: Drop in for a petit gateau dessert made with local honey, hazelnuts, walnuts, Fair Trade couverture, salted caramel ganache cream and peanut butter mousse throughout October. Cost: $16.95 includes a locally roasted Umami coffee or Josophan’s signature hot chocolate. Details: (02) 4784 2031 or josophans@bigpond.com. 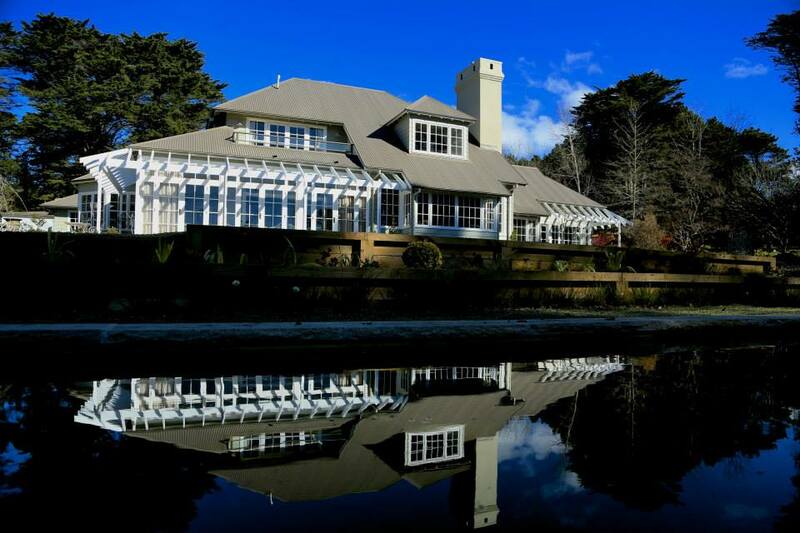 Nineteen23, Silvermere Guesthouse, Wentworth Falls: Dine in heritage splendour on a specially crafted three-course menu featuring produce from local suppliers and the mansion’s kitchen garden (wander through before dinner) on October 25. Cost: $105 includes matched wines. Bookings: 0488 361 923 or info@nineteen23.com.au. 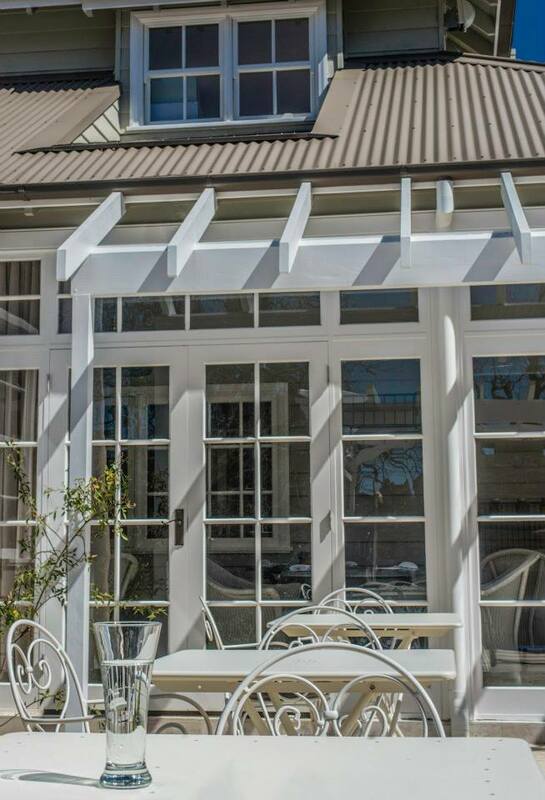 Leura Garage: Shift gears up the mountain for the seasonal set share dinner menu. Cost: $55 includes a glass of wine. Offer available on select dates. Details: 0450 900 333 or amanda@leuragarage.com.au. Megalong Valley Farm: Escape to the beautiful Megalong Valley for a two-course cider sampling lunch in the wilderness and pastures. Choose from more than 20 varieties of boutique and mainstream ciders. Cost: $85 per person. Bookings: (02) 4787 8188 or SMS 0408 649 235. Details: megalongcc.com.au. for $30. Details and bookings: (02) 4782 1111 or thecarrington.com.au/menus. Journey through Tuscany in five courses at Vesta on October 23. Vesta Bar & Bistro, Blackheath: Journey through Tuscany in five courses on October 23. Dishes on the set menu use superb regional produce matched to Italian wine varieties of the Central West. Cost: $120. Bookings: (02) 4787 6899. TAFE WSI Wentworth Falls campus: Indulge in the ultimate high tea at the newly refurbished Hydro Majestic Hotel, Medlow Bath, on October 25. Cost: $75 per person. Bookings: (02) 4753 2004 or Gillian.cowie@tafensw.edu.au. Go to sydney.goodfoodmonth.com for more information about Good Food Month. Dine with the locals and enjoy a main course starring local produce with a matching glass of Central West wine at the Old City Bank Brasserie. NPWS Discovery Ranger Kathy Butler takes children and their parents on some nature play activities to re-connect with the earth. Photo: David Hill, Blue Mountains Lithgow & Oberon Tourism. 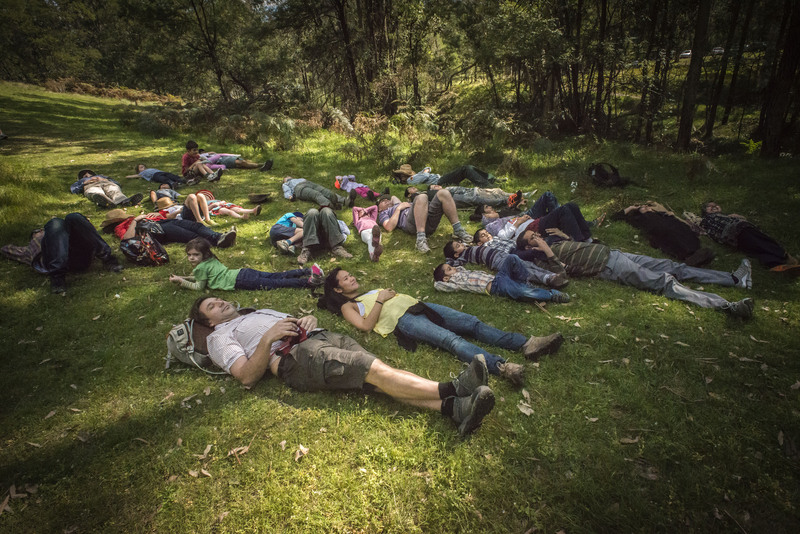 Under a clear spring sky with kookaburras and cockatoos vying for attention, the annual Festival of Walking was launched at Euroka Glenbrook, Blue Mountains National Park, on Saturday, September 20. Visitors and locals enjoyed a community barbecue; learned about bush safety from NSW Police Rescue Senior Constable Chris Jayne, Aboriginal culture and the NPWS Bush Trackers program; and embarked on a “nature play’’ children’s bushwalk during which kids had the opportunity to smell gum leaves, draw, create, play games, explore the bushland and share the joy of the simple things life has to offer. Blue Mountains Lithgow & Oberon Tourism (BMLOT) chairman Daniel Myles acknowledged Blue Mountains Mayor Mark Greenhill, Blue Mountains State MP Roza Sage and Macquarie Federal MP Louise Markus who attended and paid special tribute to Katoomba resident Marie Wood for instigating the “no brainer’’ festival several years ago. During her Welcome to Country, Gundungurra elder Aunty Sharyn Halls encouraged everyone to explore the landscape on bushwalks and engage with National Parks & Wildlife Service (NPWS) Discovery rangers and local Aboriginal people to learn about one of the oldest continuous cultures on earth. He, Mr Myles and Snr Const Jayne urged all walkers to practice safe walking habits by planning ahead, wearing appropriate clothing and footwear, carrying plenty of water and food, registering their walk at Springwood or Katoomba police station or the NPWS visitor centre at Blackheath where they can borrow for free a personal locator beacon and staying on the track. 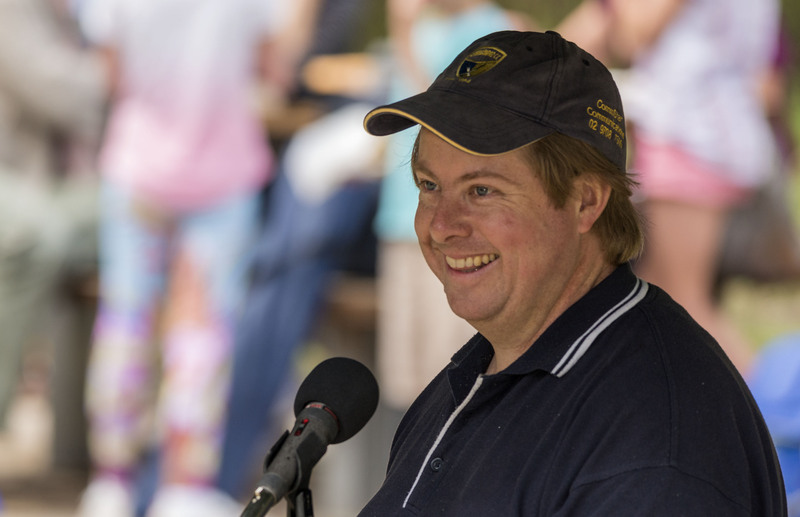 Mayor Mark Greenhill encouraged people to explore Aboriginal culture and the grand backyard of the Greater Blue Mountains World Heritage Area as a family. 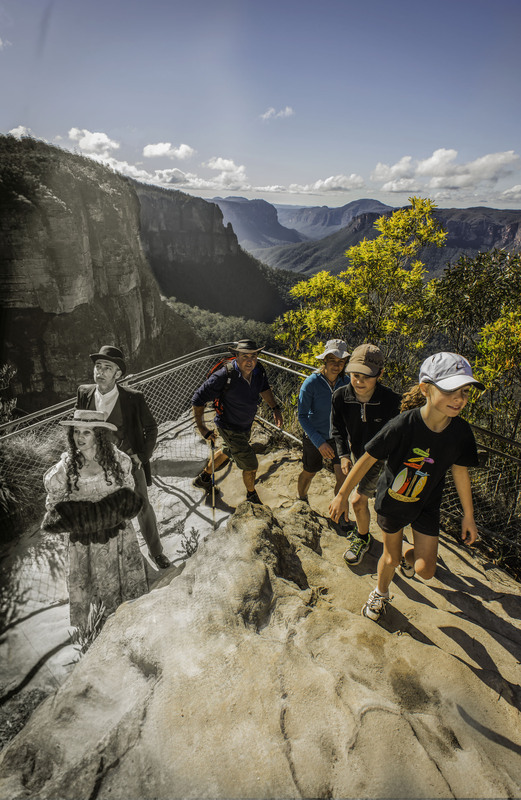 The Festival of Walking showcases the Greater Blue Mountains World Heritage Area to nature lovers of all ages, budgets and fitness levels and will continue throughout the school holidays until October 19. Presented by the official regional tourism organisation and supported by the NPWS, local councils and Destination NSW, the Festival of Walking includes self-guided walks, adventure walks with expert guides, Aboriginal experiences and non-nature walking activities such as history rambles and a beer walk. Go to www.festivalofwalking.com.au for more information about the Festival of Walking and www.visitbluemountains.com.au for dining, accommodation and other activity options. 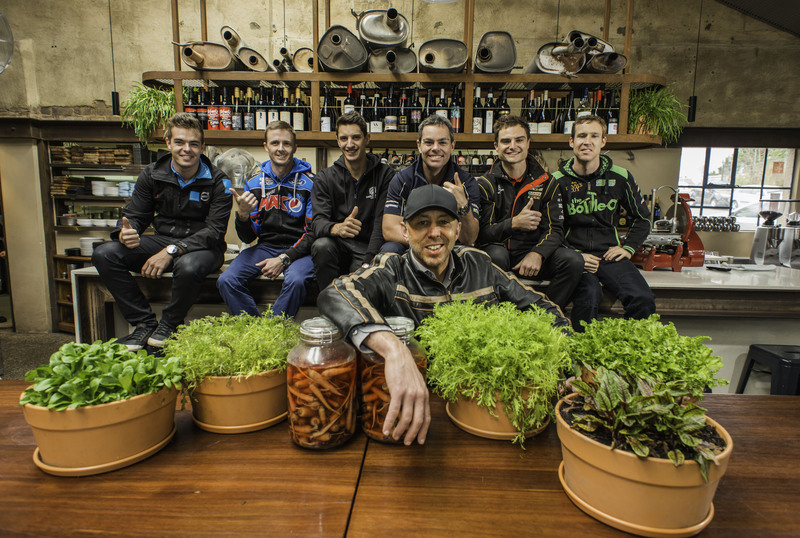 They may be comfortable driving at 300km/h around one of the world’s most famous race tracks but the six V8 Supercar drivers who visited the Blue Mountains last Tuesday [September 9] could not tame our Blue Mountains. Exactly one month before this year’s Supercheap Auto Bathurst 1000, Bathurst great Red Bull Racing’s Craig Lowndes and current champion Pepsi Max Crew FPR’s Mark Winterbottom joined young Mount Panorama hopefuls Scott McLaughlin, David Reynolds, Tim Slade and Nick Percat at the gateway to Bathurst. The six challenged themselves to stand on the edge of a mountain and literally let go. Some fared better than others. The sheer drop was, almost, as daunting as Mountain Straight, Skyline or Conrod. 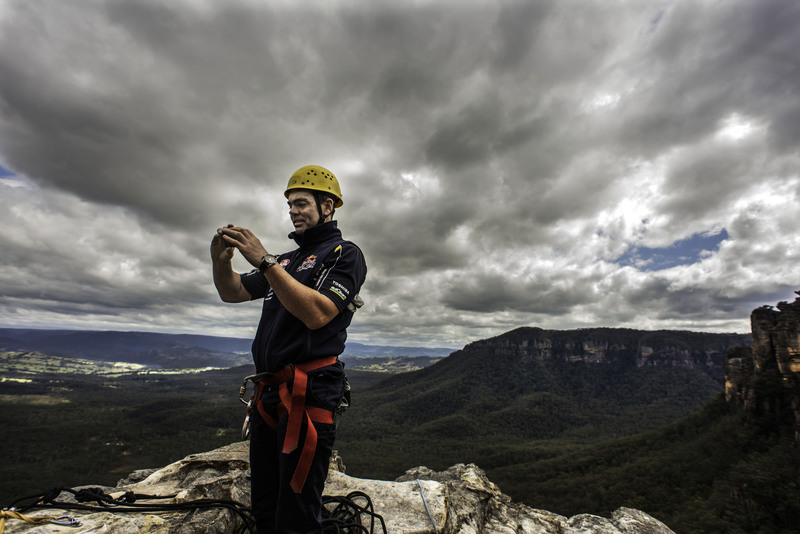 However, they were in safe hands under the guidance of 25-year abseiling veteran Darren Trew from Katoomba outdoor adventure business High n Wild and his expert guides. High n Wild dedicated six guides as well as Mr Trew to the event, which went for the entire morning. 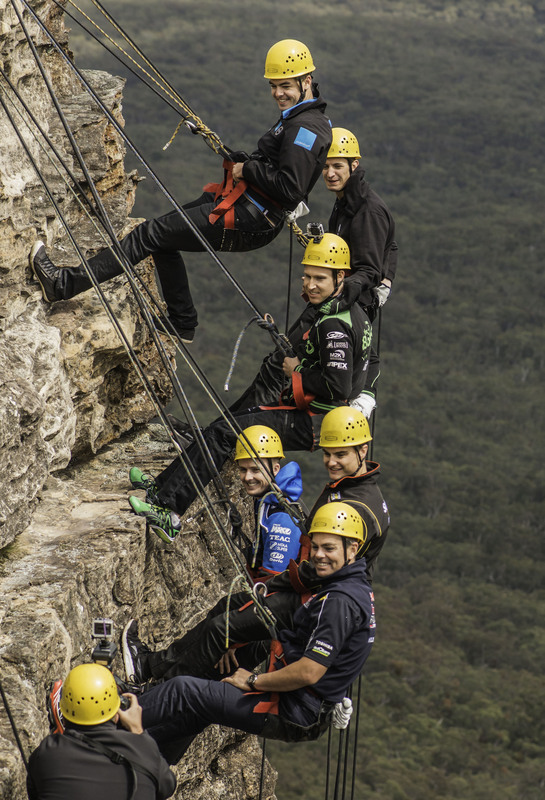 Five-time Bathurst 1000 champion and eight time Sandown winner Lowndes said while he wasn’t terrified, he was not as comfortable abseiling down a cliff as he was behind the wheel of a race car. Lowndes said he was a fan of the Blue Mountains, which is a great stop over or base for Bathurst race goers. He and his family had stayed at Blackheath Glen Tourist Park for several days last year on their way to Mt Panorama. Reigning Bathurst champion Winterbottom said: “Most of the guys have that fear of heights or something, where we drive 300 kilometres an hour people are surprised that we have fears, looking over the edge it is a bit daunting. You have no control so a little bit different. After their abseiling experience, the six drivers and their crew lunched at, where else, Leura Garage. Owner James Howarth opened the converted garage, now a thriving funky cafe/restaurant, especially for the group. The visit was facilitated by Blue Mountains Lithgow & Oberon Tourism (BMLOT), the official regional tourism organisation. BMLOT chairman Daniel Myles said: “We may not have a V8 Supercars racing track in the Blue Mountains but our thrilling outdoor experiences absolutely match the adrenalin hit sought after by the likes of these speedsters. “This region is also an ideal pitstop for petrol heads travelling to and from the races at Bathurst, so break your trip with a meal and a cuppa, stretch your legs along a bush track and visit one of our outstanding attractions businesses. Kids can truly be kids at the official launch of the 2014 Festival of Walking at Euroka Blue Mountains National Park, Glenbrook, on Saturday, September 20. The free community event at the popular picnic spot within Blue Mountains National Park will kick off the annual Blue Mountains Lithgow & Oberon Tourism (BMLOT) festival. 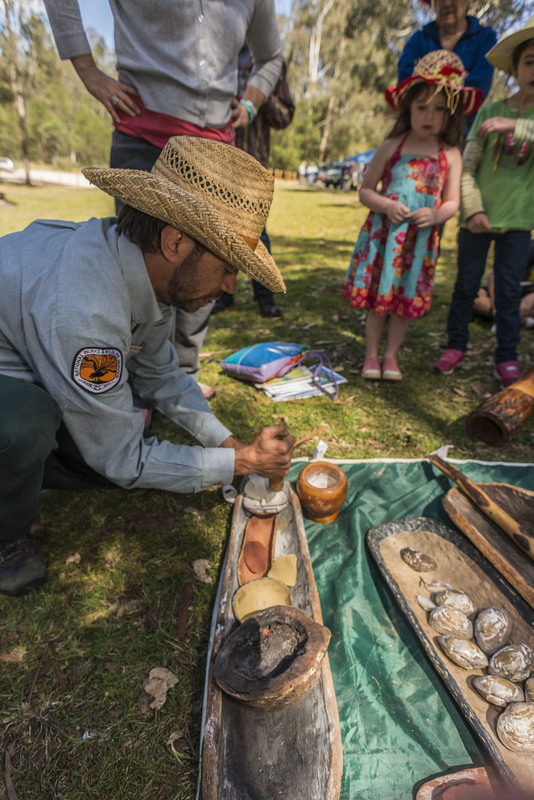 One of the main activities will be a “nature play’’ children’s bushwalk during which parents can take some time out with their little ones to have a National Parks & Wildlife Service (NPWS) Discovery ranger guided hands on experience in nature. Children can smell the gum leaves, draw, create, play games, explore the bushland and share the joy of the simple things life has to offer. 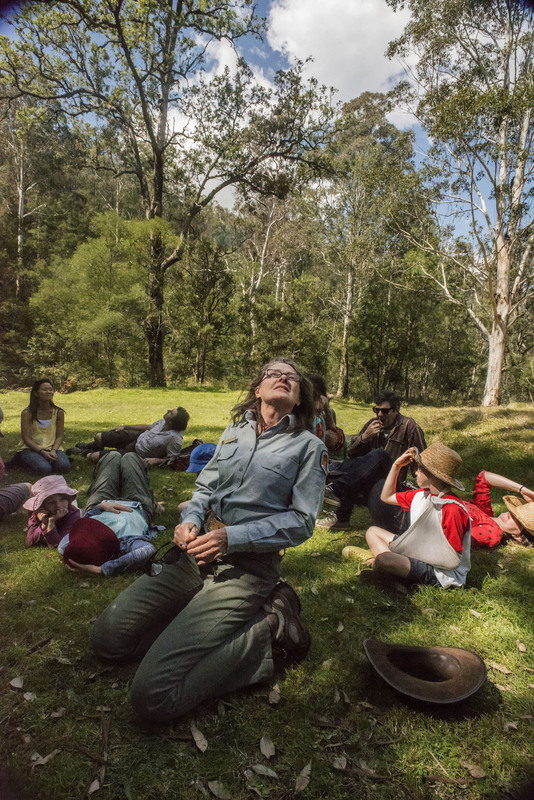 The Festival of Walking, which showcases the Greater Blue Mountains World Heritage Area to nature lovers of all ages, budgets and fitness levels, has been extended this year to include the spring school holidays and will be held from September 20 to October 19. 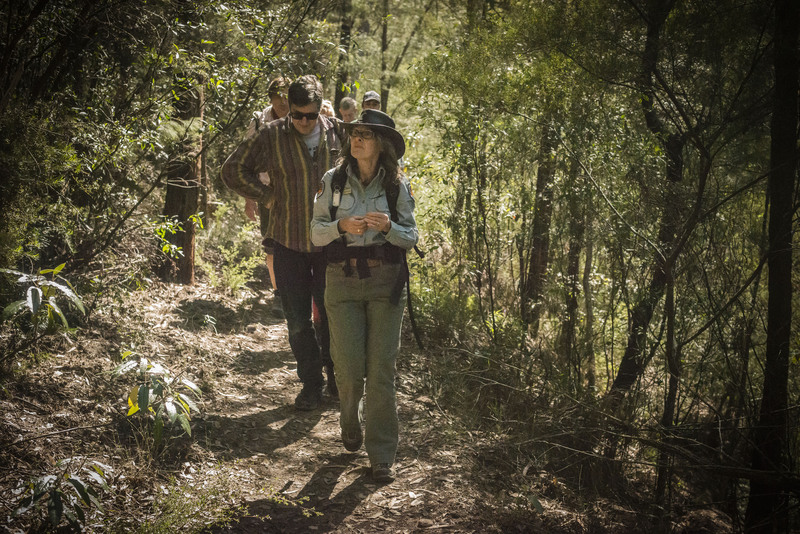 Presented by the official regional tourism organisation and supported by the NPWS, local councils and Destination NSW, the festival will include adventure walks with expert guides; non-nature walking activities such as a history walk, literary walk and a beer walk; and self-guided bushwalks. BMLOT chairman Daniel Myles said: “The launch event, like the whole Festival of Walking, will be a fantastic family event with something for everyone. 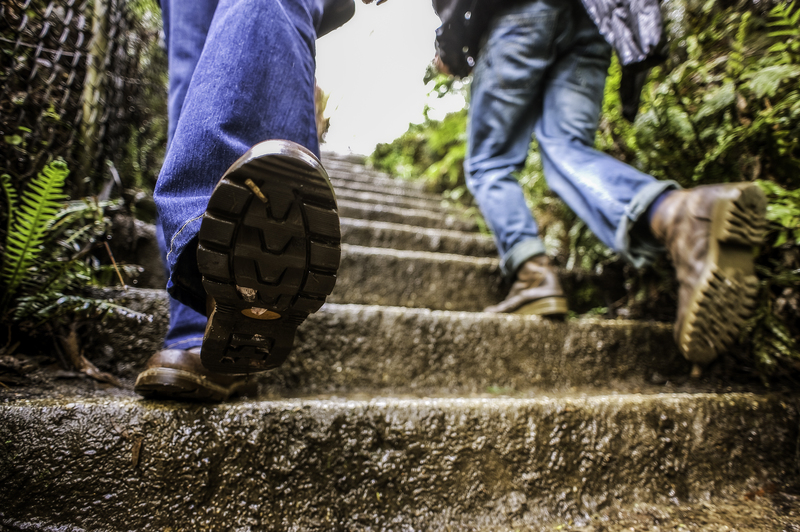 Intrepid bushwalkers of all ages can take part in the Festival of Walking. “Experienced guides and well maintained tracks will provide a safe environment for locals and visitors to explore our magnificent World Heritage Area,’’ Mr Myles said. The festival was inspired several years ago by Katoomba resident Marie Wood who read about the award-winning Isle of Wight walking festival and believed “something similar would be perfect for the Greater Blue Mountains … good for encouraging people to stay for a few days’’. 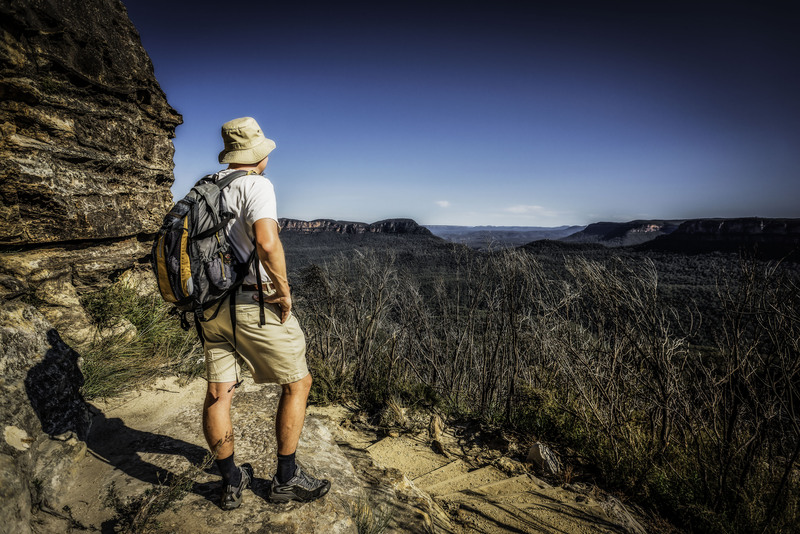 In fact, the Greater Blue Mountains is one of Australia’s 16 recognised National Landscapes and the Blue Mountains, Lithgow and Oberon region is the richest destination for walkers and outdoor enthusiasts in the country. The official launch of the festival will be held at Euroka in Blue Mountains National Park, end of Bruce Rd, Glenbrook, from 10am to 1pm. It will include family-friendly activities, Wanda the Wombat NPWS mascot, educational stalls and a community barbecue. Visitors and locals can catch a train from Central to Glenbrook or from Lithgow to Glenbrook and either walk to the Blue Mountains National Park, entrance at Glenbrook (15 minutes) or catch the shuttle bus. Go to www.festivalofwalking.com.au for a full program of events. Catch a glimpse of our grand backyard by watching this short video: https://www.youtube.com/watch?v=FzVgf1H4bBg. Blue Mountains Cultural Centre proudly presents the major exhibition Brett Whiteley: West of the Divide. Curated by Wendy Whiteley and the Art Gallery of NSW, this exhibition focuses on the enduring connection that Whiteley had with the region west of the Great Dividing Range and features 35 works including painting, sculpture and drawings that span three decades of the artist’s career. 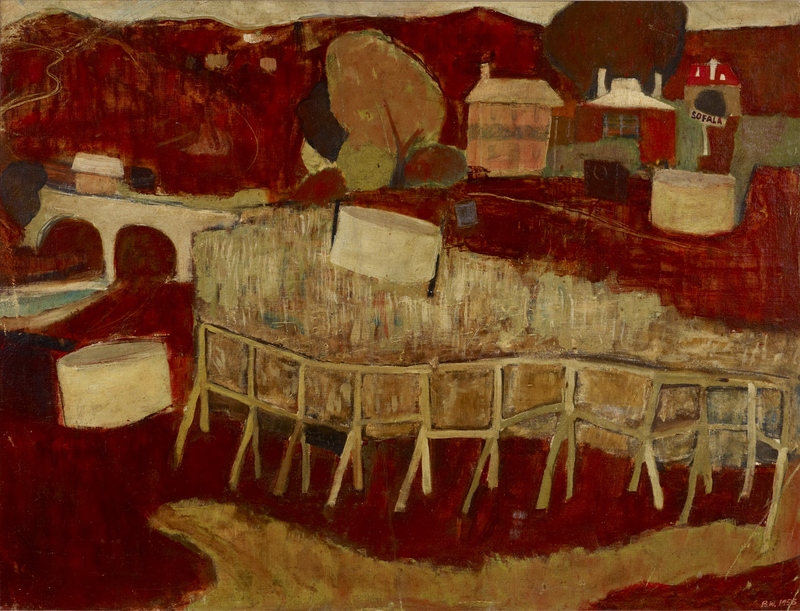 From his formative years as a student at Scots College, Bathurst, throughout his life, Brett Whiteley had a lasting connection with the Central Tablelands country of NSW. Many of the works featured are rarely seen and provide a wonderful insight into the artistic development of Whiteley from his early career in the late 1950s through to the end of his life in the 1990s. 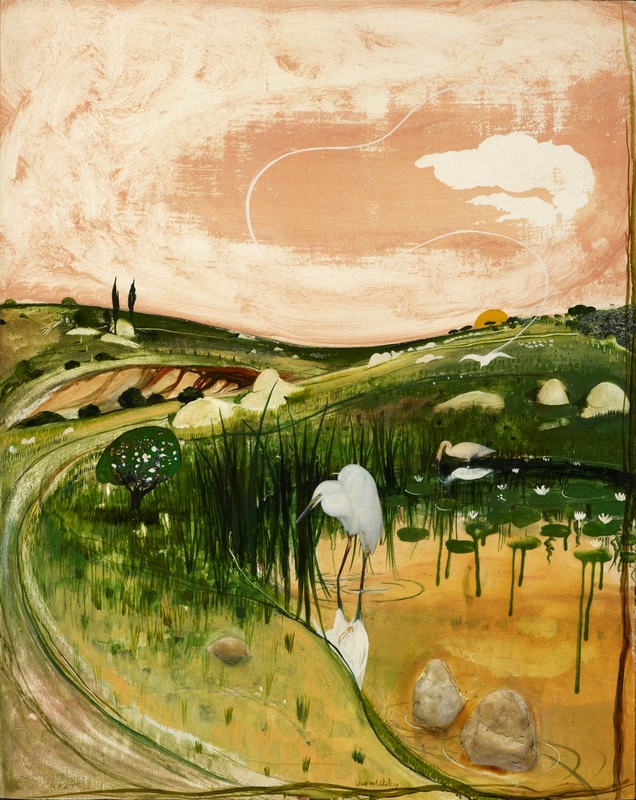 Brett Whiteley’s affinity with the landscape west of Sydney encompassing Oberon in the Blue Mountains to the Central Tablelands through Bathurst, Orange, Lucknow, Milthorpe, Carcoar, Sofala, Hill End and south to Marulan, is little documented in the many texts that have been written on his oeuvre, yet the artworks produced of and inspired by this region are some of the most magical. Saturday, October 4, at 2pm: In Conversation: Blackheath Portraits +2. Join photographer Graham McCarter and Curator Rilka Oakley for an insight into the exhibition and McCarter’s photographs of Brett Whiteley. Friday, October 24, at 6pm: Artist talk with Peter Kingston, who will discuss his experimental film project featuring Brett Whiteley. Bookings for all programs essential: info@bluemountainsculturalcentre.com or (02) 4780 5410. 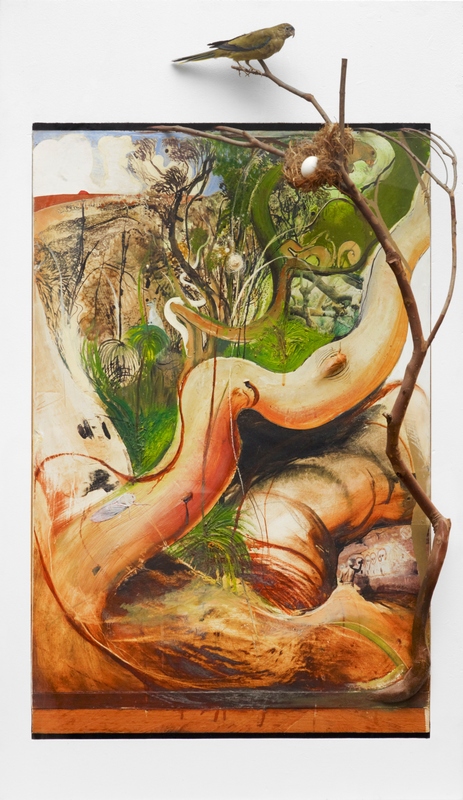 Brett Whiteley: West of the Divide opens at Blue Mountains Cultural Centre, 30 Parke St, Katoomba, on Friday 26 September and runs until Sunday 30 November. Cost: $5 adults, $3 concession, free cultural centre members and under-16. Details: http://Brett Whiteley: West of the Divide opens at Blue Mountains Cultural Centre, 30 Parke St, Katoomba, on Friday 26 September and runs until Sunday 30 November. Cost: $5 adults, $3 concession, free cultural centre members and under-16. Details: www.bluemountainsculturalcentre.com.au.